If you’ve ever traveled to Everest Base Camp or seen photos of glaciers in the Everest region, you’ll notice that the lower regions of these glaciers don’t look like your typical clean ice glacier. Instead, they are covered with debris. In fact, Everest Base Camp (Figure 1), located at 5,360 metres above sea level, is set up each year on top of the debris-covered portion of the Khumbu Glacier. Figure 1. 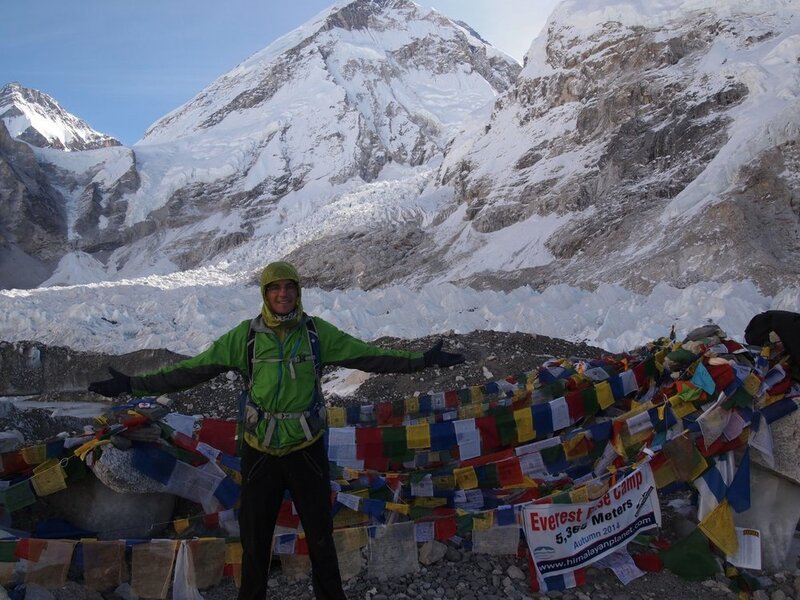 David Rounce taking a quick break from his fieldwork in 2014 to visit Everest Base Camp in the Nepal Himalaya. The glaciers in this region are primarily avalanche-fed debris-covered glaciers meaning that avalanches and rockfalls from the headwalls surrounding the upper portion of the glacier cause debris to be deposited on the glacier surface. This debris is then rafted down-glacier as the glacier flows over time causing the debris to accumulate at the terminus of the glacier. This explains why the debris is the thickest at the end of the glacier and thinner further up glacier. This debris cover fundamentally alters how these glaciers will respond to climate change. A thick layer of debris (greater than a couple centimeters) will insulate the underlying ice and reduce glacier melt, while a thin layer of debris (less than a few centimeters) will absorb more radiation and can actually increase the melt. While this relationship between debris thickness and glacier melt is well known, quantifying the debris thickness over an entire glacier has remained a challenge – until now. Our recent study published in the Journal of Geophysical Research: Earth Surface has developed a new method for estimating the debris thickness for three glaciers in the Everest region of Nepal. Our method uses pairs of high-resolution digital elevation models to estimate how much the glacier is melting, and then uses the well-known relationship between debris thickness and glacier melt to estimate the debris thickness. We found that on the tongues of Khumbu Glacier and Ngozumpa Glacier, one of the largest debris-covered glaciers in the Himalaya, the debris thickness was around two metres thick! These estimates agreed quite well with previous measurements and were the first time that debris thickness estimates had been validated on the glacier scale. Figure 2. The debris on this portion of Imja-Lhotse Shar Glacier commonly exceeded one metre. Here, an automatic weather station is being installed during a field expedition in April 2017 to better understand debris-covered glacier melt (credit: Chilton Tippin). The thick debris on these glaciers (Figure 2) has important implications for how these glaciers will respond to climate change. Specifically, the debris thickness tends to be the thickest at the bottom of the glacier and become thinner further up glacier. Since the glacier melts more beneath thin debris compared to thick debris, the glaciers can actually melt more up glacier than it does at the bottom of the glacier, which causes the slope of the glacier to flatten. These gentler slopes enable supraglacial ponds to develop, which has occurred on both Ngozumpa Glacier and Khumbu Glacier over the last couple of decades. The supraglacial ponds on Khumbu Glacier (Figure 3) have already begun to impact one of the popular trekking routes, Kongma La Pass trail, with researchers from the University of Leeds projecting that this trail across the Khumbu Glacier will likely be impassable by 2020. Figure 3. Supraglacial pond and ice cliff on Khumbu Glacier (credit: Owen King). These supraglacial ponds also signal that the glaciers are storing more water on their surface and in their subsurface via englacial conduits as well. This stored water has the potential to be suddenly released causing a glacier outburst flood*. This happened at Lhotse Glacier, another glacier located in the Everest region, in June 2016, which was caught on video by Elizabeth Byers. Glacier outburst flood from Lhotse Glacier in June 2016 was captured on video by Elizabeth Byers. While it is difficult to determine when and how frequently these outburst floods occur, the development of these supraglacial ponds is certainly important to monitor, they may eventually coalesce and develop into a large glacial lake. These glacial lakes can store a tremendous amount of water and can become a hazard for downstream communities. Imja Lake is an excellent example of a debris-covered glacier that developed from a few small ponds in the 1950s into one of the largest glacial lakes in Nepal today (Figure 4). In 2016, the outlet of Imja Lake was lowered by three metres to reduce the hazard associated with a glacial lake outburst flood (GLOF). Figure 4. Repeat photographs of Imja Lake from 1956 when the lake did not exist (credit: Fritz Müller) to 2007 where the lake has become one of the fastest growing lakes in Nepal (credit: Alton Byers). A recent study in Nature estimated that roughly 18% of the total volume of ice in High Mountain Asia is beneath debris-covered glaciers. Another study in the Everest region estimated the debris-covered area is as high as 32% and is increasing as these glaciers continue to melt. Therefore, if we want to truly understand how these debris-covered glaciers and their potential hazards may evolve in the future, we first need to understand how the debris thickness varies on these glaciers. Our study is hopefully a good start. *Glacier Outburst Floods are slightly different to the more famous Glacial Lake Outburst Floods (GLOFs).